On behalf of the European Atherosclerosis Society (EAS) and the Dutch Atherosclerosis Society we invite you to the Netherlands, to the charming and historic city of Maastricht and the 87th EAS Congress. During the meeting we will explore the latest developments in research into the causes of atherosclerosis and related vascular disease, and how these may affect the clinical guidelines for diagnosis and treatment. Clinicians and basic researchers studying atherosclerosis and related vascular disease are welcome to submit an abstract, to present their findings to the international scientific community at EAS 2019. The EAS 2018 Scientific Committee has created an innovative programme featuring influential speakers in their respective fields. EAS 2018 Lisbon welcomes a distinguished international faculty to share their pioneering perspectives on the latest developments in basic research and clinical practice in atherosclerosis and cardiovascular disease. As a measure of the Society’s commitment, EAS is offering Young Investigator Fellowships to selected abstract and oral communication presenters aged 35 or under on a competitive basis. Application open September 17 – December 11, 2018. Submit your abstract by December 04 to be eligible to apply for a Fellowship. 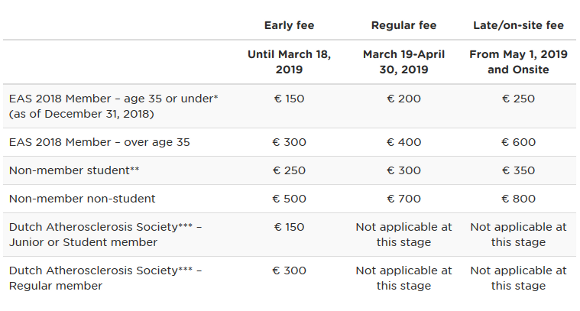 These grants are awarded to selected presenters of poster or oral communications who live and work in countries where funding for travel to international meetings is difficult to obtain. Application open September 17 – December 11, 2018.Submit your abstract by December 04 to be eligible to apply for a Travel Grant. These annual EAS prizes for young scientists are intended to recognize distinction shown by publications that contribute to the advancement of knowledge in the field of atherosclerosis and linked metabolic disturbances. We award two prizes of € 2000 each. The winners of the Awards for outstanding publications 2018 will be awarded at the EAS 2019 Maastricht Opening Ceremony.